Accuweigh recently commissioned a gross weight bagging machine for filling bags and plastic pails with herbicides in Boggabilla in northern New South Wales. Sold by Accuweigh’s Newcastle branch, the Budpak gross weight bagging machine was supplied with a 100-litre capacity inlet hopper, floor-mounted support pedestal and hanging-plate attachment to fill the pails. The Budpak gross weight bagging machine weighs the product in the bag during the filling cycle. A radial catch gate assembly is operated externally by a pneumatic cylinder and adjustable flow control regulator. 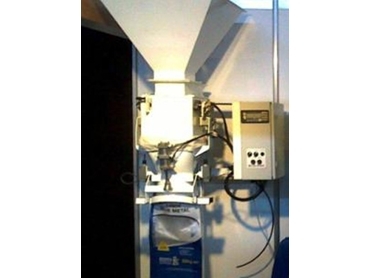 A pneumatically operated dust-tight bag holder with hand activated limit switches clamps the bag on operator input and initiates the filling cycle of the bagging machine. Accuweigh also supplied a foot operated heat sealer with the gross weight bagging machine for closing the plastic bags. Suitable for closing PE, PP, LDPE and PVC materials, the heat sealer has the head set at a 45-degree angle for easy bag insertion when using a conveyor system to transfer the bags from the bagging machine. Accuweigh’s scope of supply for the gross weight bagging machine included delivery to site in Northern NSW, as well as supervision of installation, commissioning and operator training by an Accuweigh technician. A leading Australian industrial weigh/packaging group, Accuweigh has branches in all mainland states providing full service support on weighing equipment, bagging machines and bag closing equipment.